UNICEF and partners are working tirelessly all over the world to save and protect children. Growing up in Hawai'i, people often ask, "What makes Hawai'i Hawai'i?" My answer is, "It's the 'keiki' — the children." Even as adults, Hawai'ians consider ourselves "Keiki O Ka 'Aina" or "children of the land." Often, we fail to nurture the earth we live on and recognize the people that make up our community. A notable issue here in Hawai'i, especially in the red light district in Honolulu, is human trafficking and prostitution. After backpacking and volunteering in several countries for a few years, I grew close to a few victims of trafficking and met with nonprofits, including UNICEF staff and volunteers who offered valuable solutions to combat trafficking. WIth that, I aspired to spread awareness by first targeting those who were willing to listen. I went to schools and farmers' markets, and took to social media to spread awareness of both my fundraiser and issues of human trafficking. I am beyond happy that so many people were willing to support me, including friends, family and strangers at home and overseas. Fundraising was an uphill battle almost as difficult as reaching the summit of Mount Kiliminjaro, the tallest peak in Africa. Don't miss a beat! There were many times where I felt like I needed to hurry as other hikers overtook me. I almost felt like I was in a race when someone I hadn't seen for miles would suddenly start a conversation and the continue quickly up the mountain. I maintained my pace and, happily, I was one of the many who reached the next camp a few hours before sunset every evening. Overall, I learned that I can achieve any goal as long as I keep moving on my own time. Reaching the summit was breathtaking, but the path to the top taught me more about myself. I will never forget the laughs, the new Swahili words I learned and the number of mantras I had to whisper under my breath to get me to the next step. In the beginning, I was only focused on the outcome. Now, I've come to realize that what's most important are the lessons I learned along the way and the memories I treasure. If I didn't know my purpose on Kilimanjaro, I might have easily given up. Life loves to place us in a series of tests. It is essential to know our purpose when beginning anything. My "why" for Kilimanjaro was to give a voice to those without one: the child victims of trafficking and exploitation. They gave me the reason to wake up at 6 AM every cold morning and walk another 8 hours. I was also excited to have local companies such as Olukai, Progene Hawaii and Ao Organics, and foreign companies like Ohm Skincare on board to support my fundraising efforts. 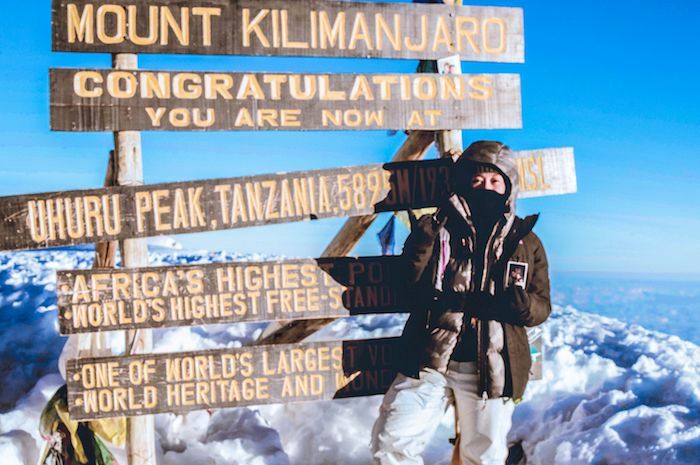 Because of UNICEF, my supporters, friends and family, I was able to reach the summit successfully! Learn more about how you can create a fundraiser to support UNICEF's work on behalf of the world's children. For over 70 years, UNICEF has been putting children first, working to protect their rights and provide the assistance and services they need to survive and thrive. With a presence in 190 countries and territories, UNICEF has helped save more children's lives than any other humanitarian organization in the world.